The beauty of science fiction is there no real rules other than the science has to stand up, and it has to sound plausible, even if it isn’t. I’ve read more varied books under the “science fiction” label over the last few months than I ever have with romance, which is why I love it. 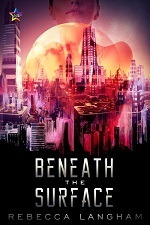 Beneath The Surface is a meaty read, an involved novel with a plethora of secondary characters surrounding the two main protagonists, privileged Lydia and sharp Alessia, her Outsider counterpart. This story could have been written in a simpler style, and it still would have been a good read, possibly a little easier to get through. There seems to be quite a bit of set-up, when really, the story just needed to get on with it. Having said that, the author has done a great job in lovingly creating the world inhabited by the humans and Outsiders, and whilst doing so, keeping relevant with various issues troubling the world today. The refugee crisis and alienation of races seem horribly familiar, with the aliens being almost too human so at times. It didn’t seem too preachy, but if you’re looking for escapism rather than realism, this may not be the book for you. There is a lot to pick over, and it would take me a couple of readings to pick up all the subtleties. Like I said at the start, it is a substantial read. At times I felt it seemed longer than it should have been, and it took me a while to warm to the characters but the last third of the book was definitely worth waiting for. Finally, I thought the book was well-written, a serious sci-fi novel for far less frivolous readers than myself. I stand in awe of the world the author has built and the gravitas of the overall book. It will be very interesting to see where the series goes from here.